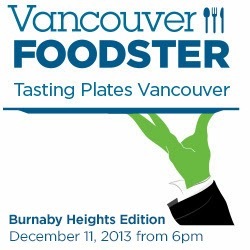 I swear Vanfoodster made a deal with either someone up there or down there regarding the weather for his Tasting Plates events. For the 3rd straight time, awful weather during the week gave way to clear skies when it mattered. Either he is a great negotiator or has a stash of rabbit feet somewhere. Whatever the case, I was invited to the Burnaby Heights edition along with Sean, Alvin, Diana, Amy and Jeremy. I brought Whipping Girl partly because Chez Christophe was on the menu (something about her whining about wanting to revisit the place). 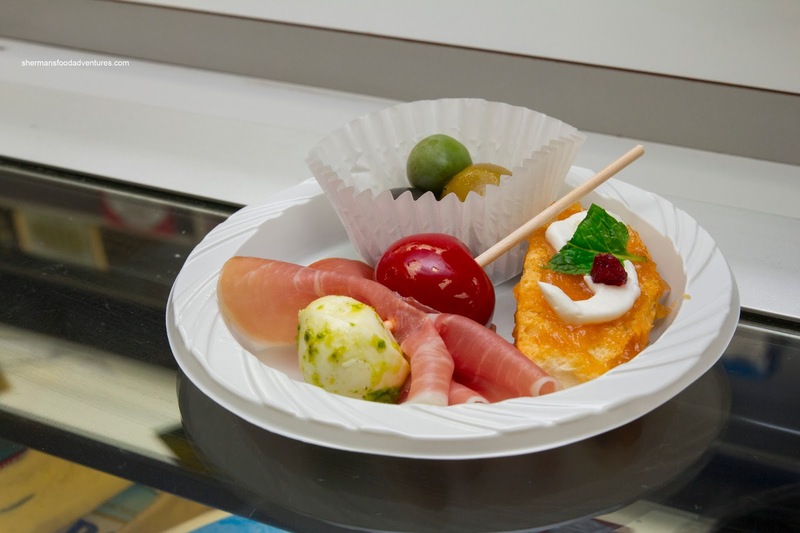 We started at Cafe Divano, where we were given an option to choose 3 treats from their display. Alvin, being the VIP, got all of them, so the picture represents all of the available choices. 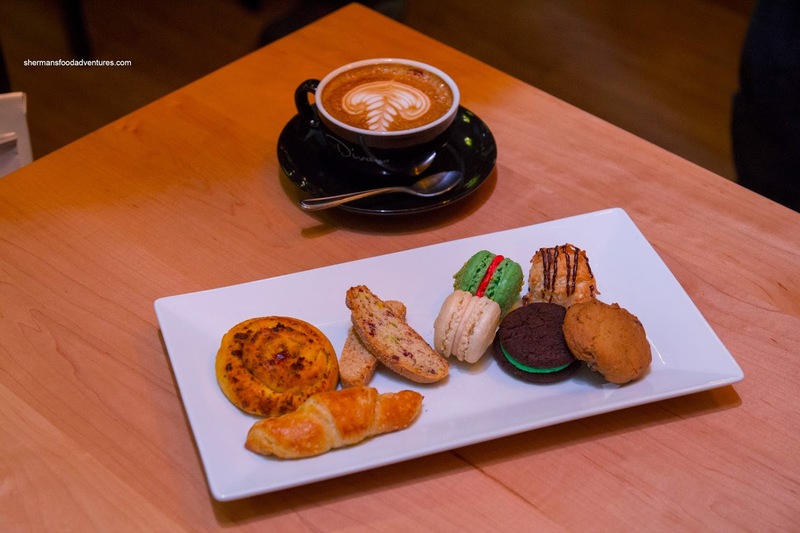 From left to right, there was a Savoury Brioche, Biscotti, Macarons, Macaroon, Chocolate Chip Cookie, Mint Chocolate Cookie and Mini-Croissant. Not pictured was a cute Gingerbread Man. Our choice of beverage included Spanish Latte, Cappuccino (pictured) and Christmas in New York. Loved the soft brioche, but the macarons were terrible being hard and gummy. Drinks were okay, if not a tad weak. 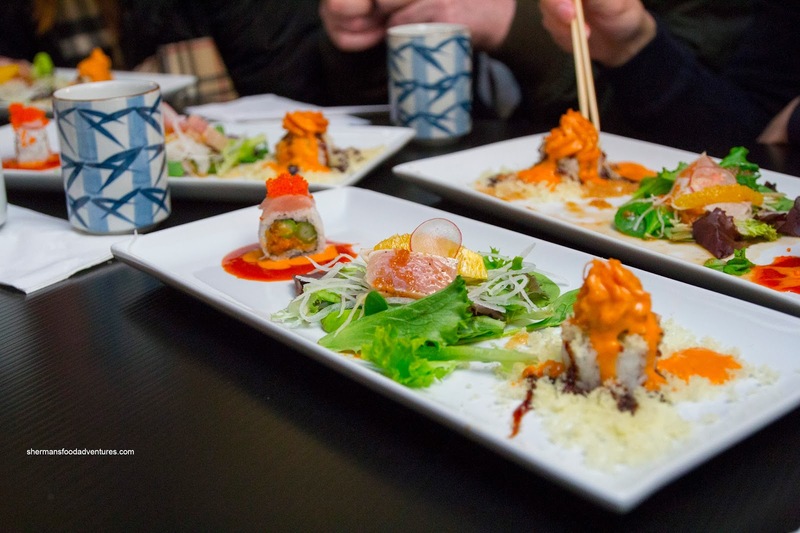 Next up was a car ride down to Yo Sushi and their tasting plate which included Red Dragon Roll, Tuna Tataki Salad and Kamikaze Roll. Much like my original visit, the rolls were fine, if not oversauced. Taking the stroll (no, we left the car alone) over to Cioffi's Deli, we were presented with and Antipasti Plate consisting of Crostini with Goat Cheese and Quice Jam, Prosciutto & Bocconcini Skewer and Mixed Olives. Loved the prosciutto as it was meaty and nicely salty. And since I love olives, there was no question I ate them all. 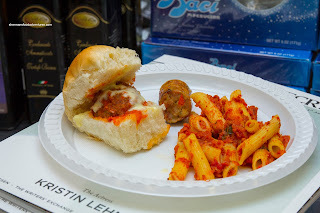 Going practically next door, we visited Cioffi's Meat Market and Gourmet Kitchen for a plate of food which included Penne with Turkey Bolognese, House Made Meatball Slider and Tuscan Chicken Sausage. 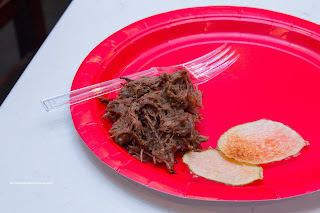 I particularly liked the sausage as it was meaty with minimal fat and veggies here and there. The meatball was quite tasty too being well-seasoned and nicely textured. 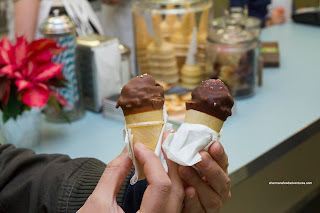 Off to some sweets, we headed over to Glenburn Soda Fountain and Confectionery. 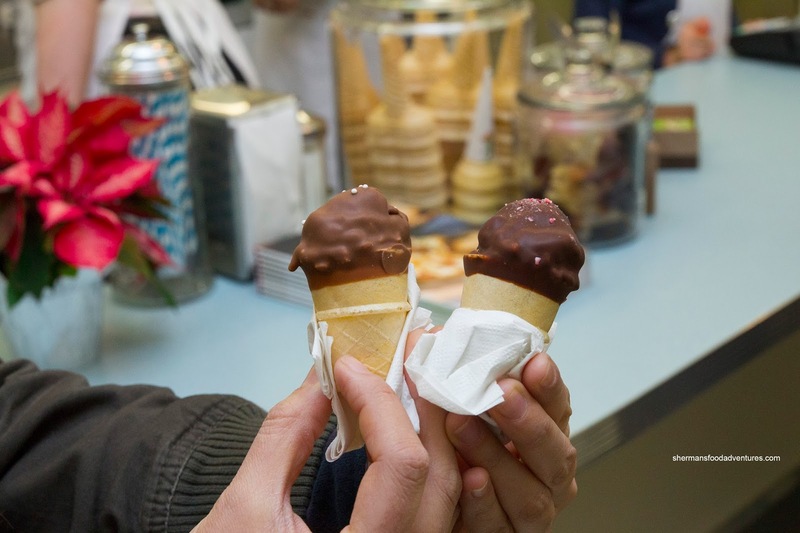 We were treated to Chocolate Covered Candy Cane or Eggnog Ice Cream Cones. I liked the candy cane more as it was a good mix of mint and sweetness. 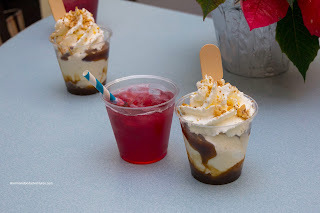 Then we tried their Butterscotch Sundae featuring Birchwood Dairy ice cream. Smooth, dense and rich, the ice cream was accented by their house-made butterscotch which was deeply sweet with a slight salt finish. Lastly, we had the Frostbites Cranberry Spice Soda. This was refreshing, tart and slightly sweet. A nice way to finish off after 2 decadent cold treats. Getting back into my car, we headed up to Stan's Pizza Joint to no avail. They were super busy. So we went across the street to Posh Pantry where we had the Wild Mushroom Short Rib Ragout and House-Made Chips (in the microwave no less!). The ragout was rich and meaty while not being overly reliant on salt. The fantastic chips (more like crisps) were remarkable coming from a microwave. Finally, we headed to the highlight of the event being Chez Christophe. 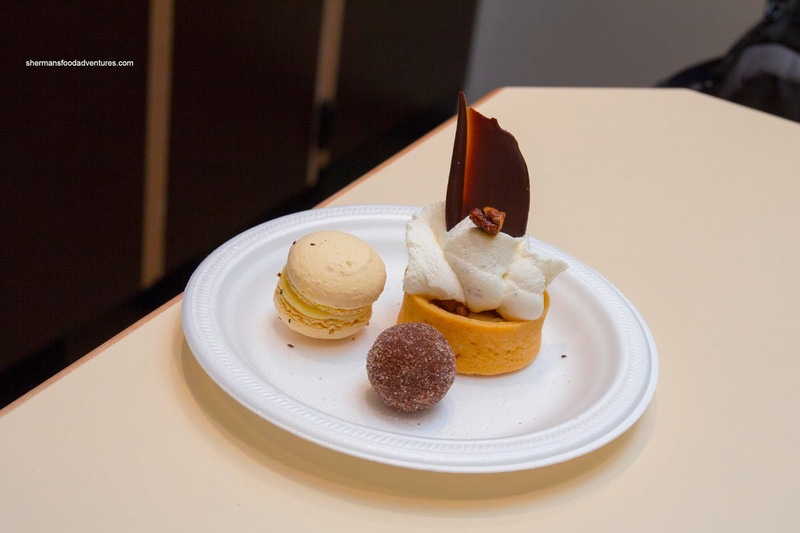 We were presented with a plate made up of a Mini-Douceur Canadienne, Olive Oil and Balsamic Macaron and Cannelle Noisette Truffle. Loved everything on the plate. Compared to Cafe Divano, this was a real macaron with subtle flavours and a delicate exterior giving way to a slightly chewy inside. We tried once more to visit Stan's Pizza Joint, but after 15 minutes of standing in the doorway without being acknowledged, we left. I've had the pizza a few times before and it is pretty standard stuff which does the job. It's too bad we couldn't get to try it this time around. 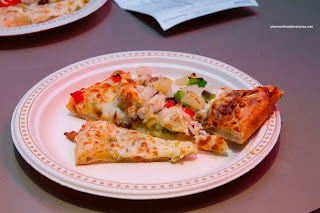 Normally, there is not much fanfare surrounding the eats around the Burnaby Heights, but it was nice to see an event here. Maybe we can coax Richard into doing a Surrey Tasting Plates?